In Key Stage four, Year 10 students continue working towards their Mathematics GCSE at a tier appropriate to them. As in Key Stage 3 they study topics in Number, Algebra, Statistics, Handling Data and Shape, Space & Measure, with a strong focus on problem solving. The students are regularly tested through the course to pick up any misconceptions that may occur and intervention put in place to correct. Students sit 3 linear examination papers at the end of their 3 year course. In Year 7 whilst covering the appropriate topics for each year group in number, algebra, geometry and measure and statistics, we aim for all pupils to build their confidence in the use of mathematical principles and to develop their mathematical thinking. We endeavour to help make the transition from primary to secondary school as smooth as possible. Learning will be a continuous process, building on knowledge gained during KS2. Your child will find some of the work similar to primary school, but it will be more challenging and the students are expected to be working more independently. 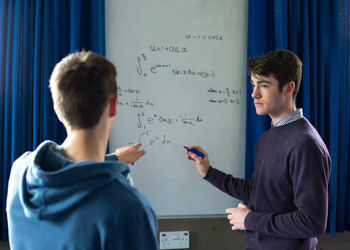 Within all topics the students will be studying, they will be developing ‘mathematical processing’ skills, which includes reasoning, analysis and evaluation. During the year there will also be opportunities for pupils to use ICT to aid their study of mathematics. In Year 8 pupils will meet new topics and build on previous work. Students will continue to develop their “mathematical processing” skills whilst covering the appropriate topics for the year group in number, algebra, geometry and measure and statistics. There will be opportunities for pupils to use ICT to aid their study of mathematics. Students start their 3 year GCSE course. This is to prepare them for the wider breadth of topics and the deeper understanding needed for the new GCSE.